“Since the prayers of the Rosary come from such excellent sources — from Our Lord Himself, from inspired Scripture, and from the Church — it is not surprising that the Rosary is so dear to our Blessed Mother and so powerful with heaven. “If we consider the power of the Rosary as seen in its effects, we find a great abundance of proofs of its wonderful value. 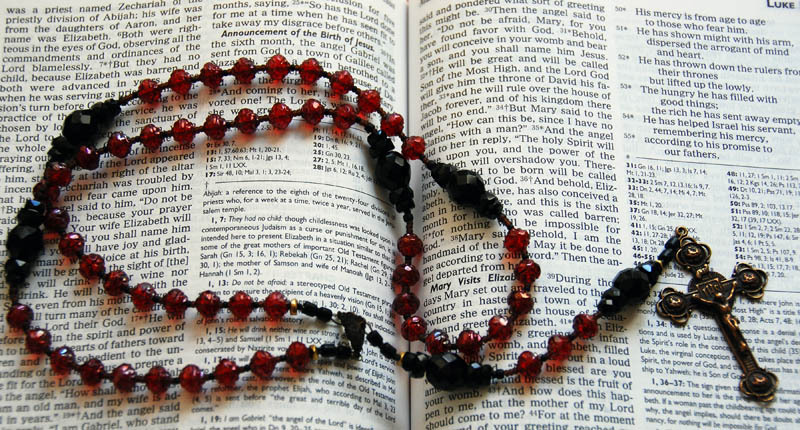 Many are the favors granted to private individuals through its devout recitation: there are few devoted users of the Rosary who cannot testify to experiencing its power in their own lives. If we turn to history, we see many great triumphs of the Rosary. Early tradition attributes the defeat of the Albigensians at the Battle of Muret in 1213 to the Rosary. But even those who do not accept this tradition will admit that St. Pius V attributed the great defeat of the Turkish fleet on the first Sunday of October, 1571, to the fact that at the same time the Rosary confraternities at Rome and elsewhere were holding their processions. Accordingly, he ordered a commemoration of the Rosary to be made on that day. Two years later, Gregory XIII allowed the celebration of a feast of the Rosary in churches having an altar dedicated to the Rosary. In 1671, Clement X extended the feast to all Spain. A second great victory over the Turks, who once, like the Russians, threatened the ruin of Christian civilization, occurred on August 5, 1716, when Prince Eugene defeated them at Peterwardein in Hungary. Thereupon Clement XI extended the feast of the Rosary to the whole Church.